Bodie Island Lighthouse, Outerbanks, NC at sunset. Thank you for the comments. This has to be my favortie out of all the lighthouses that I have seen. My husband (when he was just my fiance) worked for the Park Service at the Outerbanks for 2 years. So it's like a 2nd home to him. We try to go every year, sometimes multiple times. We had been off shore fishing out of Oregon Inlet on this particular day. I had been up since 3 a.m. and a little sea sick for the better part of the day, I was so tired. 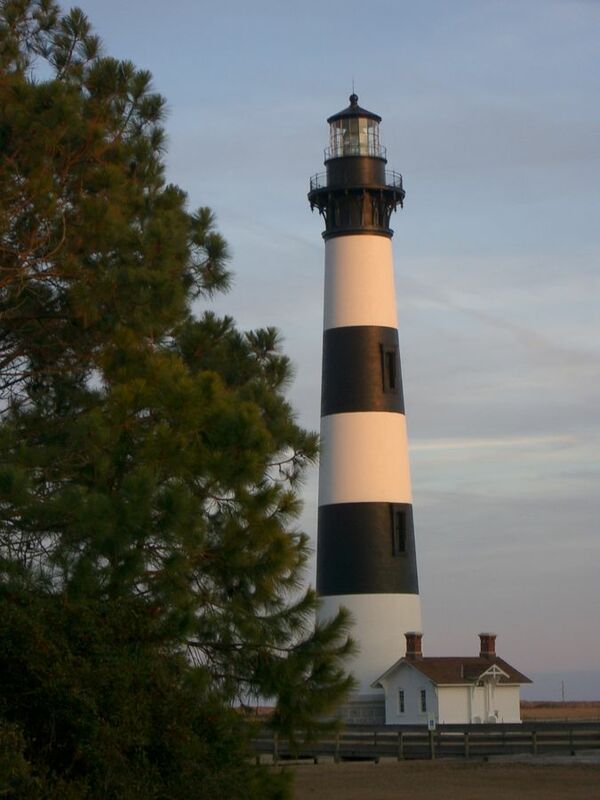 On the way back to Nags Head, I glanced over and saw the light hitting Bodie and screamed GO TO THE LIGHTHOUSE. I think hubby about wrecked us! Due to us being on the boat all day, I didn't have anything with me other than a pentax optio (the pocket size point and shoot digital 8mp) which I braced on the hood of the car. What a pretty shot with the evening sun on the lighthouse,great shot.